Left to right: Pretty Boy Floyd & The Gems, Spread The World Around, record single sleeve 1978, Ruefrex, The Wild Colonial Boy, record single sleeve 1985, and The Undertones, Teenage Kicks/Smarter Than You, record single sleeve 1978. In 1978, Northern Irish punk rock band The Undertones released their debut single, “Teenage Kicks.” The track opened with the punchy and iconic lyric, “Are teenage dreams so hard to beat?” The answer was a resounding yes, and the song became an instant anthem for the followers of Northern Ireland’s punk movement. With a new exhibition at the American Irish Historical Society in Manhattan, “Punk Troubles: Northern Ireland,” curator and punk historian Toby Mott explains why. In the midst of a civil war that seemed to rage on forever in a latticework of car bombs, shootings, and hunger strikes, the punk movement offered the working class Northern Irish youth a unique way out. It allowed them to cast off the labels of Catholic and Protestant in favor of something as defiant and protective as the leather jackets they wore. Identifying as punk offered the young people of the North a second chance to define themselves. The punk generation dressed tough, acted rowdy, and wrote songs and printed zines with every ounce of the hot-blooded irreverence that had bubbled beneath the surface for so long. Best known as the curator of the Mott Collection, an archive of U.K. punk rock and political ephemera, Mott was born in London and was a founding member of the Anarchist Street Army, a collective of young punks from inner city schools united by the ethos of bringing chaos to the London streets in the late 1970s. Later, he founded the radical art collective Grey Organisation. 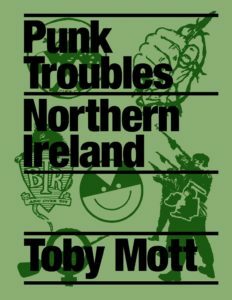 Punk Troubles: Northern Ireland by Toby Mott, published by Dashwood. The exhibition is complemented with the release of Mott’s book by the same name, designed by Jamie Andrew Reid and published by Dashwood. Together, they aim to create appreciation for the inclusive, secular space created by the punk subculture in a territory in which the hatred of the Troubles was always in the foreground. A variety of record sleeves (featuring bands such as Stiff Little Fingers, Ruefrex, and Big Self), posters, and authentic designs will be displayed alongside political propaganda from the time to evoke the relationship between the movement and its setting. “Punk Troubles: Northern Ireland” runs Thursday, September 21 – Friday, October 13, 10am – 5pm Monday through Friday and 12pm – 4pm on Saturdays. Visit here for more information. With regard to Irish Punk, Stiff Little Fingers were vitally political. Anthems such as “Alternative Ulster”, “Suspect Device”, “Fly The Flag” and their version of Bob Marley’s “Johnny Was” painted a vivid picture of “The Troubles”. Thanks for pointing that out, Chris. We’ve updated the link now.